Sunder the Sky: Op-Ed: Voluntaryists Have More in Common with Conservatives than with Liberals... a LOT More. Op-Ed: Voluntaryists Have More in Common with Conservatives than with Liberals... a LOT More. I believe that the philosophical position of libertarianism necessitates the political position of conservatism. In other words, when one is philosophically libertarian, being politically conservative is most in line with those principles. 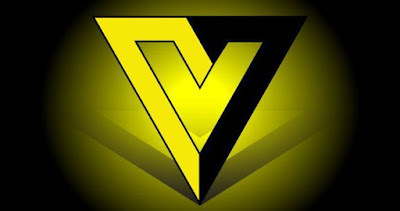 Whether or not a Voluntaryist ought to be politically engaged is a personal choice and not the issue I'm addressing in this piece. That needs to be established right up front, here. Remaining apolitical is, of course, perfectly consistent with the philosophy of libertarianism. I am only saying that, as a libertarian (and in particular as a Voluntaryist) IF you are going to become politically engaged, the position of Conservatism in regards to the State is the only one that both makes sense for you, and carries sufficient relevance to validate your engagement. To explain,... the terms "liberal" and "conservative," do not mean what they used to, in American politics. To be "politically liberal" used to mean believing that the government should change, that it should evolve in every aspect of its operations and duties. It meant that government should constantly be looking for new ways to handle things, exploring new ideas and new methods. To be "politically conservative" used to mean believing that the government should be slow to change. That we should be careful about altering or dissolving things that took effort and sacrifice to establish in the first place. It meant that protecting that which had already been discovered or gained or established was at least as important as seeking new gains. Imagine a tribe of people gathering together in the wild. Over time, they build their civilization up from the dirt and establish themselves. The "political liberals" would be analogous in this example to the explorers of the tribe, the ones who wanted to leave the village and find what else was out there that could be obtained and benefitted from. They would argue that to just stay in the village and never look for new territory would lead to stagnation and resource depletion. The "political conservatives" would be the villagers who wanted to protect and refine the village. They would argue that the prospect of what might be found elsewhere was not worth abandoning what had already been built and obtained. As Ben Shapiro has observed. Imagine two people, a liberal and a conservative walking across a vast countryside, when suddenly, they encounter a fence, blocking their path. The liberal says; "I don't understand why this fence is here. It doesn't seem to be serving any purpose at the moment. Let's tear it down so that we can proceed." The conservative says; "I don't understand why this fence is here. I should do more searching to find out why it's here before I decide whether it should be torn down." It's important to note that I'm saying "political" conservatives and liberals. Because it's important to keep in mind that we're not talking broadly about human endeavor. In our village example, both the liberals and the conservatives are an essential part of their community. The current territory needs to be held and maintained or the community will collapse, and also new territory must be explored or the community will stagnate. But, the "political" distinction changes things. "Political" does not refer to community. We are specifically talking about government. The State. The State operates in total under the authority established by the fact of its legal monopoly on aggression. "Aggression" is defined as the initiation of violent force. (That's initiation. Meaning, acting violently or threatening imminent violence before anyone else in a given situation has. Violence employed in defense of oneself or others either in person or property is non-initiatory and hence, non-aggressive.) 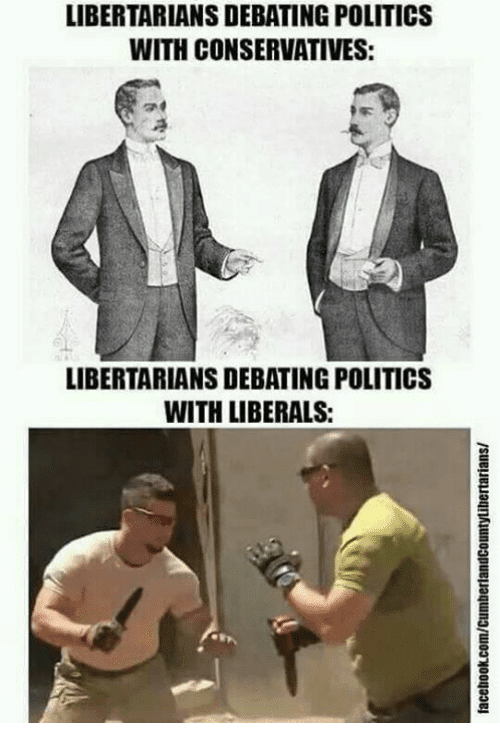 The terms "liberal" and "conservative" only make sense in reference to politics if used as descriptors for one's ideas on the appropriate application of said aggression-based authority to the address of problems, issues or challenges facing the society that a given State-apparatus is assumed to govern. The American Left is only truly "liberal" in terms of their belief in the application of government. They believe that when a problem or challenge is encountered, the society should liberally apply aggression-derived authority (government) to address it. The American Right is "conservative" in the same terms, believing in a conservative application of government to address issues. If you believe in the Non-Aggression Principle,... at all... (whether with exceptions or without) ...then to simultaneously believe in a liberal application of government/force to the address of issues is philosophically inconsistent and/or intellectually dishonest. Additionally, if you believe in individual freedom, then belief in a liberal application of aggression-derived authority is inconsistent. Philosophically, I am a Voluntaryist and Anarcho-Capitalist. For a very long time, I was against all forms of political action. I have changed on this, within the last several years. History has no examples of people successfully *ignoring* government away. Nor is there precedent for the successful institution of a voluntary society via the sudden overthrow of an overgrown state-apparatus. Collapsed states have never lead to successful anarchy. They only lead to new and more violent states. Therefore, I do believe in the reduction of government by any and all means possible, short of open violence, and I do support political actions that seek to shrink government,... *while understanding* how often such actions are mere pretexts for surreptitious government expansion. I don't believe that any political party long survives with its principles intact, so I will never register as- nor join the Republican Party. But, I do see eye to eye with political conservatives, because, as I've said... 99 out of a hundred people with *politically* conservative views are basing them on *philosophically* libertarian principles. As a Voluntaryist, I rarely agree with the Republican Party. But, I never agree with the Democrats. "Never" is significantly different from "rarely." Occasionally, a Republican proposal is a sincere effort to reduce state intrusion into private life. I have neither seen nor heard of a Democratic proposal about which the same can be said. Even those proposals with the most liberty-oriented rhetoric, are always and only couched in the expansion of aggression-based authority when they come from the Left. Sometimes, albeit rarely,... proposals that come from the Right, seek to accomplish the expansion of liberty via the reduction of government.